Heavy rain and a cold, brisk Northerly wind put off all but the keenest sailors on Sunday morning. The Race Officer set courses inside the bay to keep the boats inshore. Two Shadow catamarans flew around a small, tight course as they battled each other, never more than a dozen boat lengths apart. Martin Scott managed the conditions best and won from Paul Tanner. The Fast handicap fleet remained on shore and watched the three RS Aero's do battle in the Medium Handicap fleet. Chris Hobday liked the conditions a took a solid victory from Jane Peckham and Kingsley Brown. The Slow Handicap also only had three entries. Early leaders, Robin and Samuel Leather were forced to retire when they broke a shackle supporting the mast on their RS Feva. 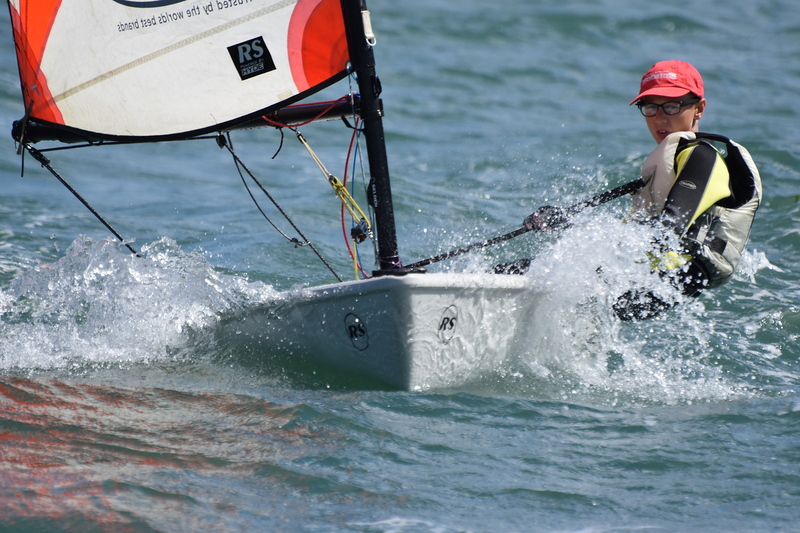 In the challenging conditions, Thomas Leather sailed well, keeping his RS Tera upright, to take line honours and first place on handicap from Steve Kimpton's Pico.